I think you can make this fixture from the pictures. The trailer ball is 2”, the threaded rod is 3/8”-16 TPI and the waste flanges are 1-1/2” Nominal Pipe Size (NPS). The ball is captured between the two flanges and is held solid by tightening the rod couplings on the threaded rod. If you want to roll the carving down to where the shaft is parallel to the bench, you would have to notch the flange accordingly, but there is a lot of movement as it is. 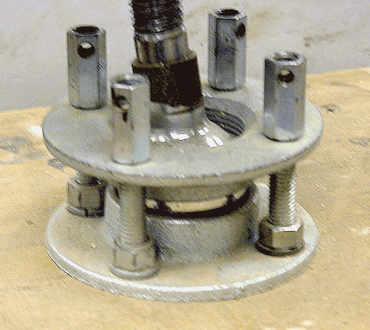 The adapter is a steel plate with a bolt that fits the threads of the trailer ball welded in the center. This is attached to the project with a couple of screws. A lock nut can be added if needed. I have seen one of these where the carver used hardwood blocks in place of the waste flanges. He used just two bolts and it works fine for him, but his projects are not real large. 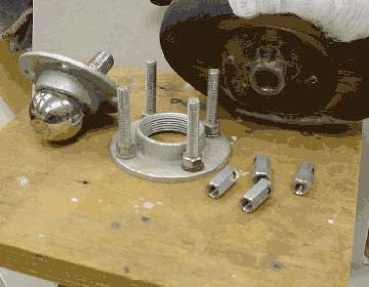 Regular nuts or a t-handle can be substituted for the rod couplings. Either way, watch out for the “pinch points”! You can improve on that by putting springs on the bolts between the flanges. Put locking nuts on two of the bolts, adjust them down close and cut off the excess, then put one of those breakover thingies from a quick release bicycle seat on the third, that way you will have a quick release on your swivel. Also, put a turnbuckle or rod coupling on the threaded shaft of the ball to extend your work away from the ball and pinch points. This whole package can be downsized by getting a one inch ball from a trailer place. I just found an article in the Winter 1999 issue of "Woodcarving Illustrated" giving the design credit for this device to Richard Rayburn of Ashland Kentucky. I know I did not come up with the original design, so if you see Richard, congratulate him! It is very possible he is the inventor of this thing. If you need any more information, email me using the form on the "Contact Me" page. Many woods can have a bad effect on the skin and respiratory system. Click anywhere on this paragraph to link to a site with information on a large variety of woods and what their effects are. 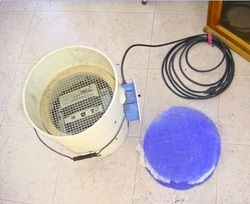 The image to the left shows the dust collector before the filter media is installed. 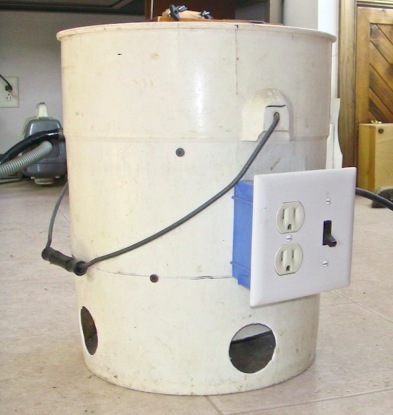 Start by drilling the outlet holes in the side of a 5 gallon bucket, next to the bottom. The total area of the outlet holes should equal the area of the top of the bucket so a minimum back pressure is created when the fan is running. The fan is mounted so there is maximum clearance beneath the fan blades so the airflow is not blocked. This will vary depending on the type of fan used. I used an old window fan for the unit shown here. Mount the electric box on the side of the bucket so you have a handy place to stop/start the fan and to plug in your equipment. Wire the fan through the switch and put a long cord on it. Make sure the outlets are not controlled by the switch. 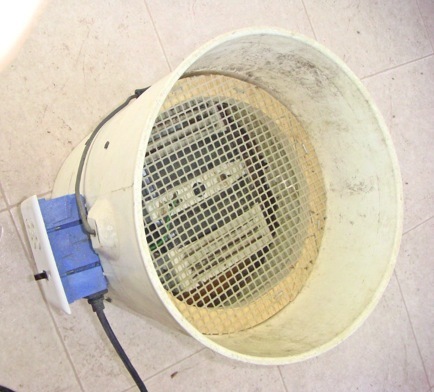 The cord can be coiled up and stored on top of the filter media for transporting. Cut a support ring to fit in the collector and hold the screen that supports the filter media. Cut the filter media from a furnace filter. You can use as dense a media as you want, but the denser it is, the less draw you will have through the collector. If you are doing coarse removal (like a Kutzall bit), you can get away with a less dense media. For fine dust you may want to use a pleated filter or a piece of cloth beneath the media. 1 - The bucket with a fan mounted inside. 2 - A piece of filter media cut from a furnace filter. The white thing is a piece of cloth I use to provide finer filtration. 3 - The power cord. This image on the left below shows the screen above the fan motor. It supports the filter media and protects the fan from anything dropped into the dust collector. This should have openings no larger than ¼ inch. The ring that supports the screen is screwed to the side of the bucket. Some collectors have been made where the screen and fan can be removed as a unit. On the image to the right below, you can see the outlet holes. These must be large enough to allow free movement of the air from the fan. You can have as many holes as you want. Some people cut slots into the bucket. Addition of the duplex outlet allows you to have a handy place to plug in your Dremel or other power carving equipment. This will allow you to carve in the living room or any other room in the house (please don't show this to your spouse! ).